So the big new political push from the anti-Trump crowd is their call to dismantle, defund, abolish, and otherwise smash ICE, aka the U.S. Immigration and Customs Enforcement. ICE was one of those mutant mergers made after 9/11 when President George W. Bush created the omnibus Department of Homeland Security and threw a whole bunch of departments into it. And because our current President, the narcissist Donald Trump, has his ego-wall in mind and a mad-hate for people coming into America… or at least the ones not working at his Mar-a-Lago resort… he’s got ICE doing his dirty work, rounding up everyone that even touches the U.S. border like they’re Pokémon. They’re ripping babies from parents, keeping kids in cages like they’re stray dogs, and they’re basically making being at the border as unbearable as possible. And it’s not entirely their fault. I mean, look who they are working for! Their bosses are a narcissist, an enabling gang of corrupt nepotists, and an elected body of sociopaths. We should just be lucky they haven’t started the old East Berlin policy of shooting-on-sight yet. And, even if they did, Trump’s corporate propagandists would hush that down faster than a mistress. So now that the world has seen our gross inhumanity with the kids in the cages and ripping babies from the arms of their mothers, a very-vocal segment of the Trump resistance movement is demanding that we do away with ICE. Either disband ICE, defund ICE, or just purge the enforcement part from immigration and customs. Basically they want to take away Trump’s new favorite goon squad. Well, I’m sorry boys and girls, but, let’s get brutally honest here… that’s just not going to happen. 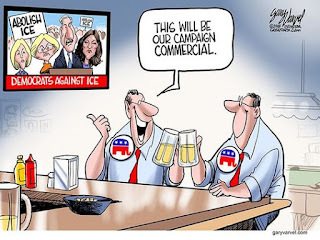 I don’t care if you somehow mange to get a complete sweep of the House and Senate in November with an impossible filibuster-proof-and-veto-proof majority, you are never going to get rid of ICE. For starters, you are dealing with Donald Trump’s new favorite goon squad. They’re carrying out his orders without question or resistance, so Trump will give them all the support and adulation that he can. And, yes, as long as Trump loves ICE, so will his cult-followers. They will blindly support anything and everything that ICE does, no matter how despicable it is. Even if they carry out a shoot-on-sight order on women and children. Because they firmly believe that ICE is doing Trump’s work... which, in their perverted minds, is the same as doing God’s work. But here’s the kicker: ICE is only Trump’s new favorite because they’re doing his dirty work without question. As soon as ICE officials start questioning Trump’s orders, or not carrying them out to his satisfaction, Trump will then treat them like he currently treats the FBI. He’d order them to be replaced, he’d subject them to his 3am Twitter-tantrums, he’d call them incompetent, he’d start firing officials that defy him, and he might even join in with the calls to abolish ICE. Because that’s how a narcissist like Trump does things. His fidelity to anything is first conditional to their fidelity with him. Let’s not forget that there are other branches of government out there! Trump’s got the military at the border! Trump loves soldiers! He never served… you know, because of “bone spurs”… but, like all good fascists, he loves his toy soldiers marching to his cadence. So… even if the Trump resistance manage to get rid of ICE or neuter ICE or otherwise get ICE out of the picture, Trump still has his soldiers to do his dirty work. And if that doesn’t work, then there is a whole alphabet soup index of agencies and organizations that Trump could mobilize and send over, and then they would be his new best friends. And… let’s face it… outside of my fellow libertarians, nobody really wants to get rid of the whole immigration system, despite the outright lies being spread by Trump and his supporters and his cult worshipers and his propagandists to that effect. The vast majority of you really don’t want open borders. You don’t! Never mind the whole pretense of “national security”; you still want the power to determine who comes in and who doesn’t. So that your hard-working American job that allows you to pay the bills isn’t turned over to someone from another country who has more education than you and is willing to work a whole lot cheaper than you. You see, I get that. I understand it. That’s why we started determining who comes in and who doesn’t over a century ago. Then there’s just the idea that everything would be okay if only we would get rid of one particular alphabet soup agency or organization. We all have one. Some of us have multiple. And they vary. In the late-80’s it was the DEA. In the 90’s it was the ATF and the IRS. And, yes, even I have a list of alphabet soup agencies that should be eliminated, starting with the FCC. But how many of them have actually been eliminated through public outcry? None of them! Not one! No matter which one of the two dominant political parties are in charge, no alphabet soup agency has ever been truly eliminated to acquiesce to public demand. They simply get renamed or they get assimilated into some other agency or some other organization. That is the intrenched nature of government. This is a rather important election year. If the people in the Trump resistance movement want to get their supporters out of their chairs and into the voting booths in November, then they need to appear to be the rational ones and not try out out-crazy Trump and his Trumpets. It doesn’t work, and, besides, they’ve been at it longer than the rest of us. You want to deal with immigration? Fine. You start on the idea of fixing what’s not working. You don’t start with wanting to abolish the department that would enforce that fix. Abolish ICE? Abolish the idea instead.